How do you feel about cilantro? If you think about it, it’s a fascinating herb. You will find it in many culture’s food that is quite different from one another. Indian, Mexican, and Southeast Asian cooking, for example. Being a huge fan of Indian, Mexican, and Southeast Asian food, I can’t imagine my life without cilantro. It is probably the herb I use most in my cooking, with the possible exception of thyme, and that is because I have thyme growing at the bottom of the stairs to my house. I understand that some people don’t like cilantro. And by not liking it, I mean they have a true aversion to it. I had a doctor in one of my Thai cooking classes and she said that is indeed true that some people carry a gene that makes cilantro taste like soap. So if you carry that gene, my apologies and seeing as this recipe has an entire bunch of cilantro in it, this dish is not for you. Sorry. 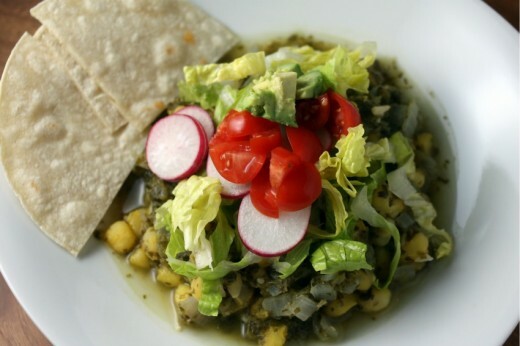 This is a favorite dish from Jack Bishop’s A Year in a Vegetarian Kitchen. It is one of those recipes that takes next to no time and yet produces a seriously tasty result. You start an onion sautéing on the stove, whir together some tomatillos, jalapeños, oregano, and a lot of cilantro in a blender, mix it all together with some hominy, and let it cook for about 15 minutes. While it cooks, you thinly slice some romaine lettuce, radishes, quarter some cherry tomatoes, and cube some avocado. 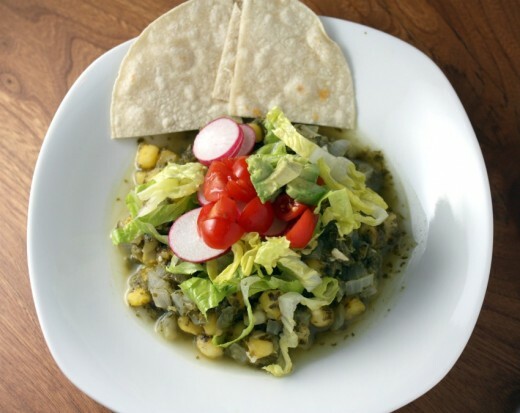 Ladle the hominy mixture in a bowl, top it with the fresh stuff, and dinner is served. Randy and I like heat so I seeded one of the jalapeños and left the seeds and membranes in the other one. It was perfect for us but if you are unsure – go ahead and seed both of them. Finally, just to answer some questions about hominy. Hominy is a type of corn but it is much starchier and larger than the corn kernels that we know and love. Its texture and size is necessary here – regular corn would make this a rather anemic stew. I found mine in canned vegetable aisle near the corn. White or yellow works. My only word of warning is that the cilantro mixture, which is vibrantly green in the blender, will turn a mossy shade of green as it cooks. Do not be alarmed, the vegetable mixture on top is nice and colorful. Place the cilantro, oregano, tomatillos, chiles, and 1 cup of the water in a blender and purée, scraping down the sides of the jar as necessary, until smooth, about 1 minute. Place a sauté pan over medium heat. Drizzle in just enough canola oil to coat the bottom then add the onion along with a large pinch of salt. Cook until golden, about 6 minutes. Add the garlic and cook until fragrant, another minute or so. Add the cilantro mixture, hominy, remaining 1½ cups water, and bring to a boil. Reduce the heat and simmer to blend the flavors, about 15 minutes. Adjust the seasoning, adding salt to taste. 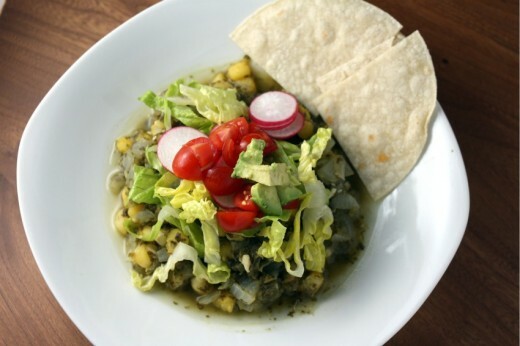 Ladle the posole into bowls and serve immediately, passing the lettuce, tomatoes, radishes, avocado, and tortillas at the table. I love hominy but have never cooked with it. A restaurant where I used to work made a delicious spicy soup with giant hominy pieces, and we servers couldn’t stop stealing tastes from the soup urn (so we could better describe it to the diners of course!). I guess you used canned hominy in this? Sounds easy! I will have to keep an eye out for it. This looks like my favorite kind of meal – simple and fresh with lots of nice spice. I’ve never ever cooked with hominy and would corn work instead? Or should hominy be tried – I don’t think it’s that easy to find here. Regardless, it looks lovely. Yum! I’m a big fan of cilantro so this looks like something I would love. I’ve never cooked with hominy either, but have always wanted to try it. I love cilantro! This dish has me intrigued I don’t think I’ve ever had anything like it. And I’ve never cooked with hominy. I’ve scene it dried before, do you think that would work too? Dana, Like you I have a tattoo on my forearm: my favorite herb CILANTRO! I think people either love it or hate it! I love it and put it in everything! It is the one herb always in my fridge. I will be making this for sure!! Love cilantro and eat it a lot. I find that it’s hard to keep more than couple days. Do you have a way to keep it fresh? People are always shocked when I tell them that my favorite herb is cilantro. they always assume it’s basil given my Italian heritage. Nope, cilantro it is! I just love that bright fresh flavor! And hominy…another addiction. My local supermarket actually doesn’t carry but next time I hit up whole foods I know what I’ll be buying! Cilantro is my FAVORITE herb. The smell is so yummy. I can’t live without it. It’s a love or hate thing. I am a cilantro fan. It grows best here in fall and winter, so I’m thrilled to have two big cilantro plants in my herb garden right now. The cilantro sauce sounds fantastic here! I love cilantro, so this dish looks yummy to me! And the smell of fresh cilantro when you’re rinsing it…..heaven! Mmm, so fresh and delicious! Perfect for these dreary winter months. Question- what brand of hominy do use?